League One side Gillingham have received a suspended £4,000 fine for fielding an ineligible player on the opening day of the season. 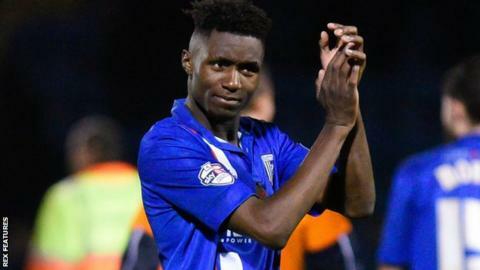 Midfielder Emmanuel Osadebe played 89 minutes as Gillingham beat Sheffield United 4-0 on 8 August. The 19-year-old had been registered with the Football League and the Football Association but there was an error in his documentation. However, Justin Edinburgh's Gills will not receive a points deduction. Osadebe moved to Priestfield Stadium last August after a spell in Tottenham's youth development programme. When Gillingham registered the player with the Football League and the FA, they indicated his previous affiliation had been with Spurs. The League registered him on 22 July but the FA did not process his registration ahead of the 2015-16 season. However, Osadebe's previous registration had been with Irish side Dundalk and he required international clearance before playing for Gillingham. A football disciplinary commission decided to issue a fine, which will only be enforced if Gillingham field another ineligible player in the next 12 months. "Gillingham have admitted that Emmanuel Osadebe should not have been selected without all of the necessary confirmations being in place," a Football League statement said. "It is also fair to say that the FA should have identified this issue earlier. Had it done so, this breach of regulations would never have occurred. "Given the exceptional circumstances of this case, the commission has ruled that the club should not find itself subject to a points deduction." Gillingham are third in the League One table, one point off the automatic promotion places.